This peak itself has no name on the Discovery map. However, a spot slightly to the west is named Tawnagradia on the OS 6 inch map. Breandán S. Mac Aodha suggests Tamhnach na gCreathaidí, 'green field of the small seed potatoes' as a possible interpretation (MNIMA, 147). If correct, this would be a graphic illustration of the desperate farming conditions here in the past, given the altitude, remote location and rugged terrain. Previously Derreennawinshin in MV. Mweelrea SE Spur is the 583rd highest place in Ireland. 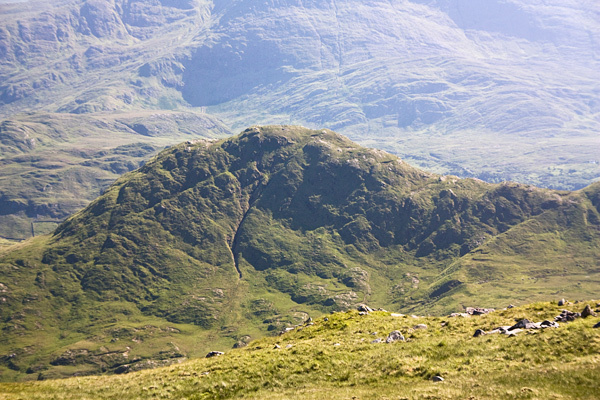 Mweelrea SE Spur is the second most southerly summit in the Mweelrea Mountains area. Picture from group : The summit from the NE in front of the 12 Bens. Picture: The summit from the NE in front of the 12 Bens. Outpost of Mweelrea with views and character. Probably most will come to the this summit before or after going to Mweelrea to which it is joined by a broad col extending NE. It has good views of the 12 Bens, the Maamturks etc and in particular of the nearly sheer east side of Mweelrea. One way to reach this summit is from the vicinity of the Delphi Mountain Resort. There is parking at the centre (it's polite to buy a drink if you are using it) or beside the road including at a nearby bridge.